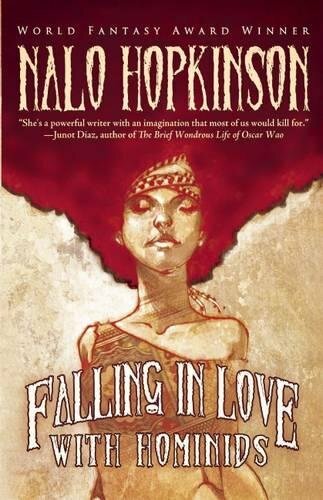 Falling in Love with Hominids opens with the confession, “I didn’t used to like people much.” Author Nalo Hopkinson acknowledges that as a teen she did not have much hope for the human species, considering the damage we wreaked on the ecosystem and the wars we waged with each other. As an adult, Hopkinson has come to appreciate the way in which science fiction and fantasy writers can bring complicated issues of race, class, gender, and privilege into their writing. This realization led to her love and fascination with human beings, who are “capable simultaneously of such great good and such horrifying evil.” This paradox is reflected in the short stories collected in Falling in Love with Hominids. Unlike some collected works, which might be conceived of as a collection, the stories were written over eight to ten years with only “Flying Lessons” appearing for the first time in this collection. Ms. Hopkinson describes herself as the “only unifying element.” While the stories reflect a diversity of themes, tones, and styles, they all reflect the messiness of humanity. The first story, “The Easthound” is a dystopic story of children coming together to survive a strange illness that has turned adults into murderous monstrosities and threatens to infect children when they mature. It is a wonderfully spun tale in which your mom might “sprout in front of your eyes and eat your dad and bite your hand off.” Children gather in warrens trying to protect themselves as well as other children from the adults they will eventually become. Hopkinson blends science fiction, fantasy, and folklore to create truly original stories. For example, “Blushing” like an earlier story “The Glass Bottle Trick,” is an adaptation of the Bluebeard folktale, but even those familiar with the earlier story will be caught by surprise by the twist in “Blushing.” All three stories explore what happens after the bride and groom say, “I do,” but “Blushing” brings a whole new meaning to the term, blushing bride, and in the process her readers are left to question the nature of humanity. The paradox of humanity is particularly evident in stories of human angst. For example, in both “Soul Case” and “Left Foot, Right” characters grapple with the consequences of their actions. Right and wrong and good and evil are revealed to be complicated whether in times of war or in the midst of simple family dynamics. “Soul Case” draws on Afro-Caribbean spirituality in its depiction of witch craft. Three witches protect their village, but at what personal cost? In this story, Hopkinson suggests that in war there are no well-defined heroes and villains. “Left Foot, Right” revolves around a character’s sense of guilt and the notion of unfinished business. This sense that something is left undone, unsaid will appeal to many readers who also have regrets or wish they could have done something different. While the story is universal in its appeal to human nature, Hopkinson’s fantasy elements, such as characters speaking to the dead and the unborn, make the story her own. Jenna acknowledges, “‘Part of me was relieved to lose you.’ Her breath catches. ‘Zuleika drowned. And part of me was glad!’” This confession to the child she lost, is a transformative moment in “Left Foot, Right.” Before admitting this to herself, Jenna had been reliving the accident and the loss of her sister, and it is only with this disclosure that she is able to move on with her life. While this is an eclectic collection of stories, Hopkinson does bring cohesion to the work through her foreword, introductory comments to the stories, and note about the author. Together, the foreword and comments about individual stories set the stage for the reader, whereas the note about the author also reflects on Hopkinson’s approach and major concerns. Falling in Love with Hominids is a wonderful treat for Nalo Hopkinson fans and a fantastic introduction for new readers. Venetria K. Patton PhD is Director of Purdue University's African American Studies and Research Center as well as a professor of African American literature and black women writers. Dr. Patton's most recent book is The Grasp That Reaches Beyond the Grave: The Ancestral: Black Women's Texts.